We hope you enjoy the below CCNA exam. Score and answers appear at the end. If you want to take it again just reload the page. If you want access to another 60 free CCNA exams plus training videos and labs then click on one of the below images of the Cisco CCNA in 60 Days study guide. When you buy the book on Amazon Kindle or printed you get free access to the members area of this site featuring over $400 worth of study tools. 1. Virtual circuits are set up at this OSI layer. 2. OSPF _____ packets are also used on Broadcast links to elect a DR and a BDR. The DR listens specifically to the Multicast address _______. 3. During a three-way-handshake you will see which three packet types? 4. Your network manager has asked you to disable CDP on the router entirely (not just an individual interface). Which command do you run? 5. A junior network engineer asks you for the bits per second setting for her console session to a router. You tell her? 6. 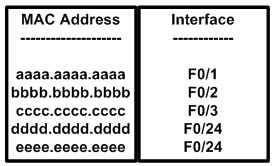 Which of the below is a valid compressed version of IPv6 address FEC0:0004:AB10:00CD:1234:0000:0000:6789? 7. Passive interfaces are usually able to receive routing updates or Hello packets but are not allowed to send any kind of routing protocol information outbound. 8. The STP Bridge Priority values range from 0 to 65535. The default value for Cisco Catalyst switches is _____. 9. HTTP with TLS/SSL uses which port? 10. Routers do not forward Broadcasts, but if they do know how to find the host (i.e., they have a route to it), they will send their own MAC address to the host. This process is called what? 11. In _______ mode, the switch will forward the VTP information received out of its trunk ports, but it will not apply the changes. 12. Which of the below are valid tunneling methods for using IPv4 with IPv6? 13. _____ mode is a PAgP mode that causes the port to initiate PAgP negotiation for a channel with another PAgP port. 14. Two types of NBMA interfaces exist. They are? 15. When using Multilayer switches, _____ is/are the recommended method for configuring and implementing an inter-VLAN routing solution. 16. There will often be situations where you have VLANs 20 to 50, for example, on one side of your network and 60 to 80 on the other. It doesn't make sense for VLAN information from the switches on one side to be passed to every switch on the other. Which service/feature will resolve this issue? 17. UDP is a connectionless protocol which operates at the transport layer of the OSI model. 18. A switch will decrease the amount of collision domains on your network. 19. _____ is a protocol used to report problems or issues with IP packets (or datagrams) on a network. 20. Tick which combinations will cause a link to form a trunk using either DTP or manual configuration. 21. Vlan Trunking Protocol (VTP) is an open standard Layer 2 messaging protocol that manages the addition, deletion, and renaming of VLANs on switches in the same VTP domain. 22. What is true about the below MAC addresses? Choose all that apply. 23. The Port Fast feature disables Spanning Tree on the selected port. 24. Which switch port security settings send an SNMP trap when triggered? 25. Which is the correct order for the DHCP packets? 26. A junior network engineer asks you what the duplex options are for a fast ethernet interface on a router. What do you tell them? 27. RSTP port roles include? 28. Enhanced IGRP sends Hello packets every __ seconds on Broadcast, Point-to-Point Serial, Point-to-Point subinterfaces, and Multipoint circuits greater than T1 speed. 29. Which part of the below MAC address is the OUI? 30. The Spanning Tree election process, in the event of a tie, uses the following values in the following order as tiebreakers. 31. ____ resolves a known IP address to a MAC address. 33. Which switch command will display the list of known mac addresses along with the port they were learned on? 34. PPP can be broken down into which three layer 2 sublayers? 35. The role of the OSI ____ layer is to set up, manage, and terminate dialogues between devices. 36. _____ was developed to eliminate the performance penalty experienced due to the first-packet process-switched lookup method used by flow-based switching. 37. You check your switch mac address table and see two mac addresses on the same interface. What does this indicate? 38. The network manager asks you to disable DTP on your switch interfaces. Which command do you apply? 39. In order for a gateway with a higher priority to assume active gateway functionality when a primary gateway is already present for an HSRP group, the router must be configured for ______. 40. Which command will reveal how your router or switch last booted? 41. An IP flow is based on a set of five, and up to seven, IP packet attributes, which may include? 42. To connect your PC ethernet interface directly into a router ethernet interface you would use a _____ cable. 43. 802.1Q supports up to ____ VLANs. Buy the brand new version of Cisco CCNA in 60 Days. Completely revised for the updated Cisco exams.